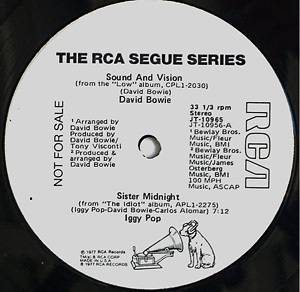 This is the first 12" featuring Bowie, although not exclusively: 'Sound And Vision' has been segued into Iggy Pop's 'Sister Midnight'. A comparable strategy was used in 1980 to promote 'Ashes To Ashes'. The A-side is in stereo, the B-side in mono. Although this white-label promo is listed as The RCA Segue Series, only one other title is known to exist.